A quick guide below to the most famous sights of Seville, currently with schedules, prices and a little history. More information and lesser known sites are on their way! If you have time take advantage of the free days to a lot of the sights. The Cathedral, Torre del Oro and other monuments have a day (or partial day) when you can enter without cost. Most offer discounts for people with student ID cards or members of the EU. Do take note that some schedules may change during winter or summer months. In most cases these are indicated below. Finally, beware of pickpockets or other people trying to take advantage of tourists while visiting some monuments. 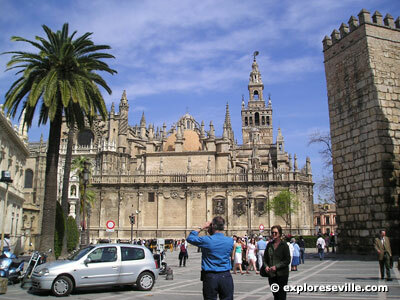 And if you are looking for more things to do in Seville try the new section: 85 Things to do in Seville! The chart below is for quick reference of the schedules, prices and contact telephone numbers for the main sites and monuments. Some monuments do not have contact information or a schedule as they are outdoors and can be visited just about any time. You can click on the link for each monument name in the chart which will bring you down to a section with more information. (see observation to the right) FREE when you purchase a ticket to the Cathedral first. The third largest cathedral in the world, behind only St. Peters in Rome and St. Paul's in England. The Cathedral does hold the record as the largest gothic building in the world, which you're sure to see when visiting. 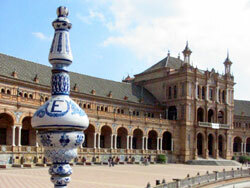 This is the most visited site in Seville. 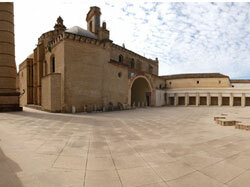 Construction began in 1401 on the grounds of the center mosque constructed during Arab occupation. 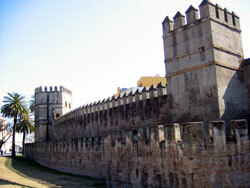 The Patio de Naranjos and the main section of the Giralda are the only structures remaining from the mosque. The climb up the Giralda, approximately 70 meters, is made easier with the absence of stairs. Instead a series of ramps leads you to the top for a perfect view of the city. 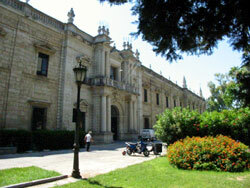 Inside are works of by Murillo, Goya, Pedro de Campaña and Luis de Vargas. Sculpture includes works by Martinez Montañés. The tomb of Columbus is said to be located here as well, a disputed claim which may soon be known as fact when the FBI finishes DNA analysis of the remains. Located between the Jardines de Murillo and the Cathedral, the Alcazar or Royal Palace in Seville is still a vacation spot for the King and Queen. Construction first began under Abd Al Ramán III in the early 10th century it is one of the best examples of mudéjar architecture in all of Spain. 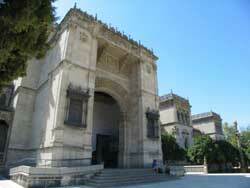 Later additions included those by Pedro the Cruel with the aid of Moorish craftsmen. The grounds and gardens around the building are an important part of the visit. If you're not able to make it to Granada to see the Alhambra make sure you stop here. Located on the Guadalquivir River and dating back to the 13th century (Almohade period), the top of the Torre del Oro was once covered in gold tiles which reflected in the sunlight, making the tower a visible fixture in Seville. During the Arab occupation it served as main point of defense and control of the river. The tower was connected to the city walls, and a large linked chain ran from the building to the other side of the river to control maritime traffic into the city. The Torre del Oro now houses the local maritime museum. The church dates back to the 17th century and the building still serves it's purpose as a refuge for the ill and less fortunate. 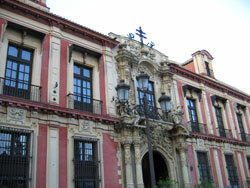 The house was provided by the wife of don Miguel de Mañara, a wealthy Sevillano, after his death. Works inside include two paintings from Juan de Valdés Leal as well as the intricate altarpiece work by Pedro Roldán. The Plaza de Toros was constructed over several decades during the 18th century and is one of the most famous venues in all of Spain to take in a bullfight. 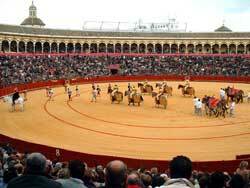 The season typically begins with the Feria de Abril, during which there is a corrida every day, and runs through September. When buying tickets take your choice of sol (cheaper), sombra (expensive) and sol y sombra (middle range) seats. The museum includes statues of famous bullfighters, posters and other memorabilia as well as a gift shop. Tue: 13:00 - 17:00 Free. Currently owned by the Dukes of Medinaceli, the palace was built in the 16th century by a wealth aristocrat after returning from a voyage to Jerusalem. The architectural styles of Baroque, Renaissance and Mudéjar blend together almost seamlessly. The complete tour includes the upstairs rooms with an impressive collection of Roman antiquities. And in keeping with the architectural styles, Baroque and Renaissance paintings. Tuesdays between 13:00 - 17:00 is free entrance for EU citizens, but they often waive anyone through. 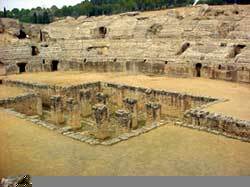 Birthplace of Roman emperors Trajan and Adrian, Italica is a 15 minute bus ride from Seville in the pueblo of Santiponce. The amphitheater is the most important site of the ruins. You're also able to walk the old streets as you tour the ruins of houses, public buildings and various objects of art. Many of the pieces can now be found in the Museo Arqueológico or within the palaces and homes of the aristocracy in Seville. Columns supporting the Giralda were also taken from the ruins of Italica. Located next door to the Hospital de La Caridad the Royal Shipyards used to house munitions and artillery for the Spanish Navy. Inside it's fairly empty except for a few exhibits and explanations in the back. Worth a stop when next door at the Hospital de la Caridad, and the rows and rows of arches make for some good pictures. Concerts and special exhibits are often held in in the building, and at times are free. 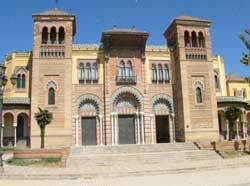 Located in the shopping district on calle Cuna, the Palacio de Lebrija is a 16th century palace which holds a very impressive collection of Roman mosaics from the nearby ruins of Italica. It is one of the few places in the world where you can actually walk on top of some of the mosaics, just as the Romans did! The excellent condition of the house is due to the extensive renovation work of Doña Regla Manjón Mergelina, the Countess of Lebrija in the early 20th century. She was a world traveler as well as a dedicated collector as the house indicates in it's displays of pieces from as far away as Mexico and the far east. Other sections of the house such as portions of the ceiling and a mahogany banister come from nearby churches and palaces in Andalucia. Thanks to her work many of the Roman mosaics discovered around Italica have been preserved. Located in the heart of Santa Cruz, construction of the building began during the early baroque period in Seville in 1676. Begun by architect Juan Domínguez, it was eventually completed in 1697 by Leonardo de Figueroa. The most impressive part is the church. entirely painted - walls and roof - with figures by Valdés Leal (and his son Lucas Valdés). Sculptures of St. Peter and St. Ferdinand by Pedro Roldán are at the foot of the nave beneath the choir, as well as altarpieces by Juan de Oviedo, and the pulpit of wood and marble by Francisco de Barahona. This is a nice Sunday afternoon visit when the entrance is free. Located on the edge of Parque Maria Luisa, the Plaza de España was designed and constructed under the direction of Anibal Gonzalez, perhaps Seville's best known architect, for the 1929 Ibero-American Expo. Now used as government offices and still undergoing renovations, it is a pleasant visit during the day and at night to see the fountain illuminated. Wandering around the semi-circular grounds it is interesting to take in the paintings over ceramic tiles, representing an historical event in each province of Spain. And children will of course recognize the backdrop as being featured in one of the latest Star Wars movies. 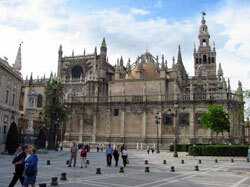 Located at the foot of the Giralda tower in the center of the historic district. 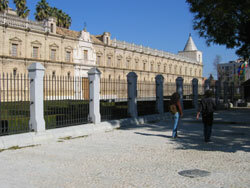 The Archbishop's Palace is an 18th century casa-palacio which is home to the Sevillian clergy and Archbishop Carlos Amigo. While you can only get a glimpse of the patio from the main gate, if you were to venture further inside you would see important works by Murillo and other painters. If you hang around long enough you may even get to see Carlos Amigo as he leaves for an afternoon stroll. I always like to think he's heading for a beer and tapas at Las Columnas. Located just outside the old city walls and opposite the Macarena Church, the Hospital de las 5 Llagas was in ruins some 15 years ago. Now completely renovated with a nice open garden in front, this Renaissance building constructed in the 16th century is now the home of the Andalusian Parliament. For general entrance it is open to the public only two days per year, surrounding February 28th and the official holiday of Andalucia Day (Día de Andalucia). Otherwise appointments can be made for groups or individuals in advance by calling ahead for the details. More information for visits can also be found on this page. Located in the very center of Seville between Plaza Nueva and Plaza San Francisco, the Ayuntamiento, or Town Hall, separates the historic and shopping districts in Seville. The 19th century renovation was the work of architects Demetrio de los Ríos and Balbino Marrón. 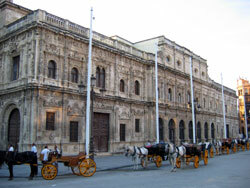 This later renovation can be seen from the side of Plaza Nueva and is an excellent example of neo-classical design. The side often featured in guide books and photos is facing Plaza San Francisco and is a wonderful example of Renaissance architecture. This side of the building was the work of Diego de Riaño in the 16th century, who used an ornate style to depict the two mythic characters Hercules and Caesar, who as legend has it founded the city of Seville. The front steps of the Ayuntamiento (on the Plaza Nueva side) are also a popular meeting place for locals! 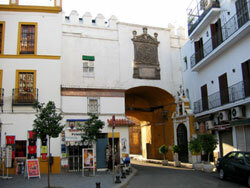 Located in the Arenal neighborhood and known simply as "El Postigo" to most sevillanos, the gate of the old city walls was once known as "El Positgo del Aceite". It was through this gate that shipments of oil from the river entered into the city. The original gate date back to the time of Ben Yusuf, but was later renovated in the 16th century by architect Benvenuto Tortello. The work of Pedro Roldán can be seen in the very small 18th century chapel just next to the arch featuring his baroque style altar piece. Located just outside the Puerta Jerez behind the Hotel Alfonso XIII, The Palacio de San Telmo was first commissioned as a university in 1685. 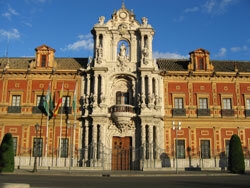 Undergoing several changes in purpose, from Naval College to residence of a noble family, the Palacio de San Telmo, like so many others, is now home to government offices and the presidency of the Andalusian Parliament. When renovated by the Dukes of Montpensier, the northern facade of the building was erected complete with statues of famous figures in Sevillian history. We have been informed that the visits, by appointment only, have now been suspended for several years as renovations will be underway soon. 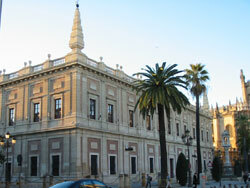 Located next door to Hotel Alfonso XIII and the Puerta Jerez, the Real Fabrica de Tabacos is now the main building for the University of Seville. Built over 50 years in the 18th century, the original purpose was the production of tobacco products from the New World, and was made famous by the Bizet's opera Carmen. At one time this was the largest industrial building in all of Europe, complete with moats, a chapel, jailhouse and several courtyards and fountains. It is very accessible, and anyone can walk through the building and around the grounds, with no appointment or entrance fee. When open the small University Chapel is also a nice visit, featuring the image of Cristo de la Buena Muerte, a work by the famous Sevillian sculptor Juan de Mesa. If you are looking for cheap food and drinks the two cafeterias inside offer prices perfect for the student budget. 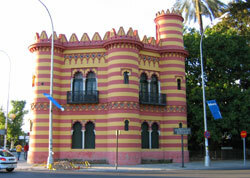 Bordering Maria Luisa Park and just opposite the river on Paseo de las Delicias is the Queen's Sewing Room, now a tourist office. Recently renovated it is perhaps the most inconvenient location of all the tourist offices, but the most historically significant. The name comes from it's use by Maria de las Mercedes, the queen who was ill and used the site as a refuge to sew or enjoy the open air close to the river. Located throughout the city the best examples of the walls can be found just next to the Macarena Church. Here a large section has been preserved, complete with lighting at night which was recently added. The city walls have a long history, dating back to Roman times. It was the during the Almoravide period that the walls saw their greatest expansion and fortifications. 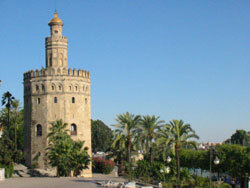 At one time Seville was completely enclosed with the walls connecting to the Torre del Oro, the principal defensive position along the Guadalquivir River. 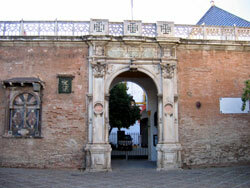 A series of 19 gates to the city were erected, often named for their purpose (entrance or exit to a neighboring town or city - Carmona, Cordoba - or a specific product - meat, oil, trash!) The last standing gate is that of the Macarena, just out of the picture to the right of the tower in the photo above. Located just around the corner from the main shopping streets of Sierpes and Tetuan, the El Salvador Church was once the site of the largest mosque in Seville, erected under the leader Abd al Rahman II, or Idn- Addabas. The only remains of the mosque on the site of El Salvador are the Patio de Naranjos, or Orange Tree Patio which is still partially preserved. The mosque was later relegated to second place with the construction of the newer and much larger mosque at the site of Seville's Cathedral. 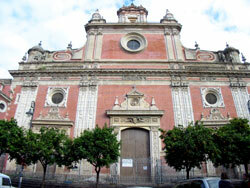 El Salvador is Seville's second largest church and an excellent example of baroque architecture. Constructed between the late 17th and early 18th centuries, many artists have contributed to the design and works inside, including: Cayetano de Acosta, Juan de Mesa and Martínez Montañés. Opened in the middle of the 19th century as a Museo de Pinturas, the museum mostly featured works from convents and churches. 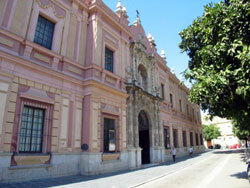 (The original building was a convent: Convento de la Merced). 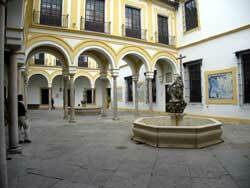 After several renovations in the 18th, 19th and 20th centuries the museum is completely renovated and now well-known for it's paintings dating from the 15th to 17th centuries of the Seville School. Works by Murillo, Zurbarán, and Valdés Leal are the most representative of the collection. Said to be the second best art museum in Spain behind only the Prado in Madrid, although I think this could be said of many art museums throughout Spain. The Archaeological Museum is located in what was the Renaissance Pavilion for the 1929 Expo, and the work of Sevillian architect Anibál González. 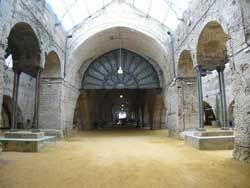 In the 1940's the archaeological collection of the Seville province was moved to the building. The Museum has some 27 exhibition rooms and includes pieces from the nearby Roman settlement of Italica. Pieces represent the diverse culture, people and history of Andalucia, including items from Tartessan civilization and much further back to prehistoric times. Exhibits and pieces cover the times from the 8th century B.C. to the 15th century. Across from the Archeological Museum in Parque Maria Luisa, the Museum of Arts and Customs contains an impressive collection of decorative arts and traditional dress/clothing. Like it's counterpart, the museum was once the Mudejar Pavilion designed and constructed by Anibál González for the 1929 Expo. Objects from everyday life - Dresses and jewels, Clothes and customs of celebrations, musical instruments, agriculture, gold work, weaving, embroidery, ceramics, furnishings and other artisan and industrial activities. There is also an exhibition of Feria posters from over the years. 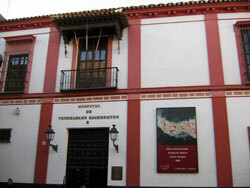 The museum also has several exhibition rooms with works from the Gothic age to the 20th century. Interestingly enough the city recently turned down a bid from a large hotel chain to turn this into a luxury hotel. Thankfully culture prevailed over the Euro. Located in la Cartuja de Santa Maria de Las Cuevas, the Modern Art Museums is dedicated to temporary exhibits of contemporary works, such as painting, sculpture, tapestry, ceramics and more. There are also several permanent exhibits, plus special performances such as dance, music, etc. The Museum of Flamenco Dance, the only one of its kind in the world, takes you on a journey to the heart of the Andalusian people, their identity and their spirit. 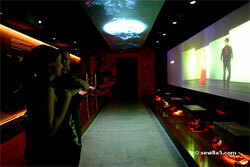 This interactive museum is where the deepest roots of flamenco and the latest multimedia technology come together. 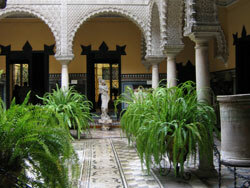 The museum is an obligatory visit for anyone who wishes to gain an insight into the culture of Andalusia.